U.S. Federal Reserve Chair Janet Yellen's seemingly harmless interest rate decision yesterday is sending the U.S. crude oil price soaring today (Thursday). At 12:15 p.m. today, West Texas Intermediate (WTI) – the U.S. crude oil price benchmark – jumped 3.6% to $39.84 a barrel after the Fed decided yesterday to keep interest rates unchanged. WTI crude oil prices are nearing their highest level of 2016 and are on track to break above the $40 mark by the end of the day. Futures for April delivery are now up 1.8% this year and 18% this month. Brent crude oil prices – the global benchmark priced in London – were also up during midday trading. Futures for May delivery ticked up 2.9% to trade at $41.49 a barrel. They're now up 5% in 2016 and 13.4% in March. Many investors are confused as to why the Fed's decision is having such a huge impact on the U.S. crude oil price. After all, it's logical to think the Federal Reserve's choice to remain stationary would have little influence on the energy sector. At the conclusion of its second meeting of 2016, the Federal Open Market Committee decided to hold rates in the 0.25% to 0.5% range established in December. Although it was widely expected, the decision is a step away from the Fed's hawkish optimism from late 2015. Following its December meeting, the committee appeared ready to institute at least four rate hikes in 2016. Now, Yellen said her team is projecting only two hikes this year. Yellen cited global economic weakness and cautious domestic growth as reasons for keeping rates static over the short term. And Money Morning Chief Investment Strategist Keith Fitz-Gerald – a seasoned market analyst and professional trader with more than three decades of experience – says recent international decisions caused these growth concerns. And that made it difficult for the Fed to move forward. "I think the international central banks are doing the dirty work for [Janet Yellen]," he said on CNBC's "Closing Bell" yesterday. "Japan made its move, China made its move, and Europe made its move with its bazooka. They are making it impossible for the Fed to raise interest rates." 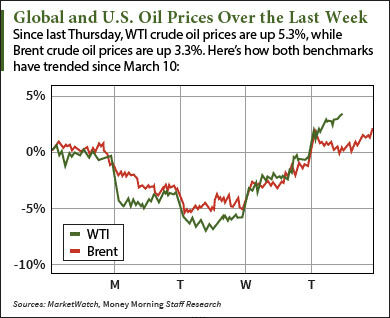 The U.S. crude oil price always skyrockets when the Fed leaves rates unchanged because low interest rates have a bearish effect on the U.S. dollar. You see, keeping interest rates low decreases the value of the U.S. dollar. Since the Fed decided to not hike rates after its Jan. 27 meeting, the U.S. Dollar Index – which measures its value against a basket of other currencies like the euro and Swiss franc – has fallen 4.3%. It's down 2% just this week alone. When the dollar declines in value, it makes dollar-denominated commodities – like oil – more attractive to foreign buyers. This subsequently boosts demand and increases both the global and U.S. crude oil price. But even if the Fed eventually raises rates, there's another issue that will have a much greater impact on the U.S. crude oil price. According to Money Morning Global Energy Strategist Dr. Kent Moors – an oil industry veteran whose career as an energy advisor to U.S. and Russian governments stretches over four decades – the declining U.S. oil rig count will gradually reduce the supply glut over time and push prices higher. Since January 2015, the number of oil rigs has dropped a whopping 73% from 1,421 to 386. According to Baker Hughes Inc. (NYSE: BHI), which tallies the number of North American rigs every week, 386 is the lowest in 10 years. "The U.S. rig count has declined precipitously… that can't help but lead to a drop in supply, especially when it comes to shale or tight oil," Moors explained last year. "It's called the decline curve and can't be finessed forever." The excess supply will also be reduced by steadily increasing oil consumption. In fact, the U.S. Energy Information Administration (EIA) reports global consumption will reach 96.5 million barrels a day in 2017. That's up 2.9% from 93.8 million last year. These two fundamental forces are working right now and will push the U.S. crude oil price into the mid-$40 range by early summer. As of Feb. 26, Moors forecasts WTI to be between $42 and $45 a barrel by June.